UPDATE: Hurry they just added 70,000 more samples if you haven’t already requested it! Click here to visit the Nestle facebook and like them. Then on the “Nestle Free Sample” tab, click “Get Your Free Sample.” Fill out the quick form and then just allow 6-8 weeks for delivery. Hurry though because it’s only for the 1st 70,000 people. Image Credit: Nestle ; thanks Stephanie! I love nestle’s products & this sounds yummy! I love anything with mint,mint choc.chip ice cream is my favorite,mint candies of all kinds,I want to try this mint cocoa!! 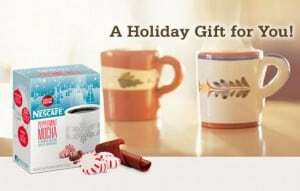 Love Everything with Peppermint….eager to try the free sample. This sound so yummy on a cold winter night! said 500 error! What’s that about? I love mocha and would love to try the peppermint mocha. Yum Peppermint Mocha – sounds great! Finally! First time it didn’t say I already got one, cuz I hadn’t! Very nice to get a freebie! I would like a sample.. Please! I would love to try this sounds amazing!